BALTIMORE – Bitcoin rose another $2,000 in the last 24 hours. Whoopee! What’s going on? Yesterday, we described an Extremely Simple Pattern (ESP). You put “money” into an economy and prices float up. Take it away, and prices fall. Prices float on a sea of liquidity. Which prices rise depends on where the money flows. Open the dikes into the consumer economy, as Lyndon Johnson did with his Vietnam War and Great Society programs, and consumer prices tend to rise. Direct the money to Wall Street – by buying bonds from big banks and other financial institutions via QE, as Greenspan, Bernanke, and Yellen have done – and it tends to drive up asset prices. Either way, there is no reason to believe that just adding “money” – dollars, euro, or bitcoin – adds to real wealth. Real wealth must be earned… by someone. Nobody complains when asset prices are rising… at least not the people who own the assets. But here’s another important ESP: When fake money causes Wall Street to go up, Main Street goes down… and vice versa. Real wealth is a win-win for everyone. But fake money is win-lose; you only gain wealth by taking it from someone else. Now, the situation has reversed. The money flows to Wall Street… we’re near a top for stocks and bonds… and Main Street sinks. The “One Percent” build their palaces in Aspen, Colorado, and Greenwich, Connecticut… while in the mill towns of Ohio and the hill towns of Missouri, people get poorer. The more the rural U.S. struggles, company officials said, the more places Dollar General has found to prosper. “The economy is continuing to create more of our core customer,” Chief Executive Todd Vasos said in an interview at the company’s Goodlettsville, Tennessee, headquarters. Well, God bless the bubble economy! It’s creating more customers for low-end retail stores. The feds promise “huge tax cuts” for the middle class. But the Deep State controls the process; its cronies get most of the money. The GOP claimed to be able to “pay for” its tax cuts by pretending they were temporary. “Sunset” limits and “trigger” devices are supposed to kick in in 2025 to reduce federal borrowing; only the corporate tax cut is meant to endure. But if the ESP of the last few decades holds, the tax cuts will turn out to be permanent… spending will go up… and the deficits will be larger than anticipated. Already, the Committee for a Responsible Federal Budget says federal deficits will increase by $1 trillion as soon as 2019. And if the sun never sets on the “temporary” cuts, the federal debt will explode. This time around, the timing is especially notable, since eight years of global growth ought to be producing tax revenues sufficient to at least moderate the tide of red ink. But apparently not. Japan already has government debt equal to about 250% of GDP. But it’s still borrowing. Britain doesn’t expect another balanced budget until 2031. China’s problem isn’t central government debt. Instead, its debt is added by companies in collusion with local governments. That debt is growing at a staggering pace, up 21 percentage points between 2014 and 2016. And much of it – about 13%, according to the IMF – was lent to “zombie” companies that lose money and have no hope of repaying their debts. 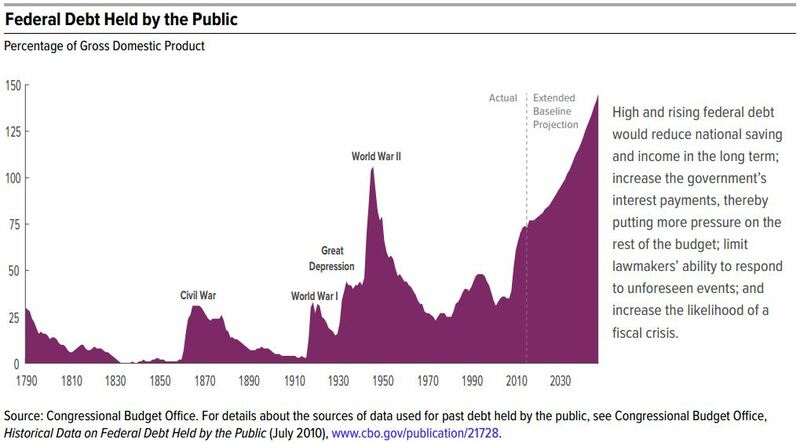 What has all this borrowing wrought? The biggest asset boom in history, with the total value of stocks worldwide at almost $100 trillion. And bitcoin… this morning… at $12,800. And here’s a final ESP: Borrow too much… then go broke.